AVAILABLE TO SENIOR MEMBERS ONLYOnly senior members, their spouses, children and grandchildren 20 years old and younger may hunt. Spouses and children may hunt only when accompanied by the senior member. The only exception will be special events approved by the Board of Directors. Please make sure to mark your stand location in the hunter shack along with name and phone number. Please make sure to add a tag out in the field to your tree stand with a name and phone number. Tree stands that aren't marked in the hunter's shack AND don't have a tag in the field will be taken down! 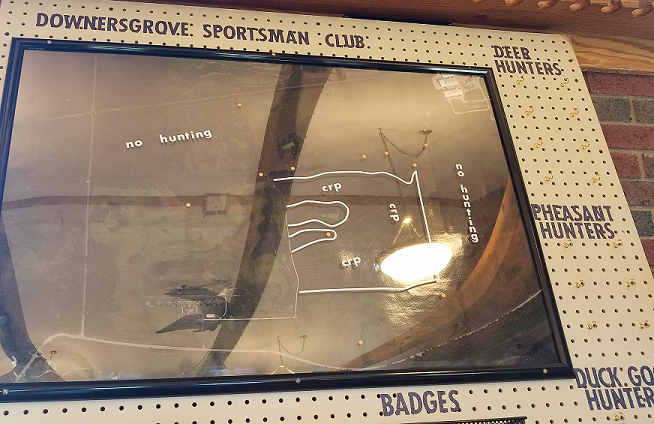 ALL HUNTERS MAKE SURE TO SIGN IN AT THE HUNTER'S SHACK BEFORE GOING OUT INTO THE FIELD and MAKE SURE TO STOP AT THE HUNTER'S SHACK AND SIGN OUT BEFORE GOING HOME! ALL HUNTERS SHOULD BE IN AN ELEVATED STANDS EXCEPT IN SPECIAL MARKED AREAS WHERE GROUND BLINDS ALLOWED. ALL GROUND BLINDS MUST HAVE A FLAG VISIBLE IN AIR!